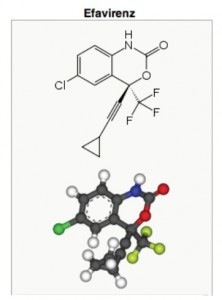 2 Sept 2010 – Last year, OMSJ identified the HIV drug Sustiva (Efavirenz) as little more than a highly addictive anti-retroviral (ARV) placebo that, when interrupted, produces withdrawal symptoms that AIDS clinicians routinely use to misdiagnose the onset of AIDS. When HIV clinicians identify these signs, they typically inform patients that the symptoms are directly “related to the onset of AIDS.” Some clinicians get angry, warning that unless they resume treatment of Sustiva drugs (like Atripla) “they will be dead within months.” When terrified patients resume their addiction, the symptoms subside – leading many to believe that the drug is staving off the effects of AIDS rather than perpetuating a physician-caused addiction. Although OMSJ was on to the Sustiva scam last year, our researchers did not recognize the active components until this week when they discovered that a variety of benzodiazepine antibodies react with the Sustiva metabolite 8-hydroxy efavirenz. OMSJ scientists determined that use and withdrawal from addictive drugs like cocaine, alcohol, heroin, tobacco THC and benzodiazepine all suppress immune function. Because smokers, alcoholics and junkies understand the lifesaving properties of a cigarette, martini or cough syrup after a week of abstinence, it’s hard to imagine how Harvard Professor Daniel Kuritzkes MD “didn’t know” that Bristol-Myers Squibb (BMS) scientists manipulated benzodiazepine in HIV drugs for the same reasons that Big Tobacco scientists manipulate nicotine levels in cigarettes. And while the Justice Department lists marijuana and benzodiazepine as controlled substances, Sustiva isn’t listed. Years before Bristol-Myers Squibb (BMS) began pushing Sustiva (Efavirenz) in 1998, studies showed that benzodiazepines (BZD) compromised immune function in sheep (1982) and mice (1988). In 1987, Arora (et al) found that a single dose of what they called “benzodiazepine receptor inverse agonists” caused “a profound suppression of the immune response” in humans. By 1992, Taupin (et al) found that a single injection of BZD “markedly altered” immune function. Ferrarese (1992) and Zavala (1997) also linked BZD to stress, anxiety and suppressed immune function. One clue came in 2006, when researchers discovered that Sustiva produced urine samples that screen positive for marijuana and hashish (THC – see Blank, Roder and Rossi). Kuritzkes and BMS failed to disclose the highly addictive and psychotropic properties of Sustiva, marketing the poison as an ARV. They knew, or should have known, how Benzodiazepine receptors interact with Sustiva (8-hydroxy efavirenz) and how Sustiva causes effects very similar to benzodiazepines like Xanax, Rohypnol and DMCM. 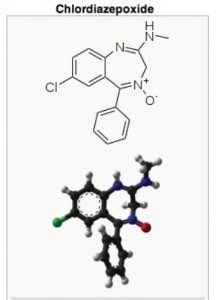 Although BMS marketers may attribute this to “Sustiva inhibiting cytochrome P450 enzymes that metabolize the benzodiazepines,” the 8-hydroxy metabolite acts like a benzodiazepine. And like Big Tobacco’s manipulation of nicotine levels, three benzodiazepines dramatically increase Sustiva’s effect and toxicity. BMS pushed Sustiva as an HIV drug that lowers viral loads and increases T-cell counts, researchers attribute these changes to the redistribution of CD4 T-cells from lymphoid tissues during the first few weeks of drug use (see also Pakker, Andersson and Hazenberg). These papers show anti-HIV drugs do not increase the production of CD4 by suppressing HIV but by changing the relative amounts of T-cells in lymphatic tissue and blood. Consider this analogy: In peacetime most soldiers are located within military bases and not throughout the general population. But when a disaster occurs, soldiers leave the bases and swarm towards attacked sites. While the absolute number of soldiers has not changed, where you find them has. HAART treatment causes CD4 cells residing in lymphatic tissue to be released into the blood. That’s why the number of CD4 cells, as well as most other immune cells, increases after taking the drugs. This is a non-specific toxic effect of the drugs. The same thing occurs during chemotherapy for cancer. A similar but opposite effect of HAART is its inhibition of the production of mRNA (messenger RNA). This explains the reduction in RNA “viral load” results after a person takes HAART (see Bucy & Andersson). Sound far-fetched? While OMSJ found no “smoking gun” related to the deliberate manufacture and sale of highly addictive psychotropic drugs under the pretext of HIV medication, the fact that the pharmaceutical industry has paid $8 billion (since 2004) to settle thousands of criminal and civil complaints related to the illegal marketing of drugs that cause thousands of preventable injuries and deaths suggests otherwise. Heavily distributed in Africa, the taxpayer-funded drug is a win for both junkies who smoke it like crystal meth and AIDS scientists whose research is funded by clinicians who identify the drug symptoms as AIDS. When companies like Pfizer, GSK and Astra Zeneca illegally push drugs that generate $Billions annually, a few million-dollar fines become nothing more than “business expenses” that are routinely passed along to taxpayers and insurance companies. This may also explain why Kuritzkes and his cohorts became unhinged after the release of House of Numbers (2008). OMSJ’s HIV Innocence Project defends those who are falsely charged with HIV-related crimes based upon questionable treatments like HAART. For as little as $5 a month, your donation helps to defray our costs. This entry was posted on Thursday, September 2nd, 2010 at 8:40 am and is filed under Academic, Astra Zeneca, Bristol-Myers Squibb, Corruption, GlaxoSmithKline, HIV-AIDS, HIV/AIDS, Harvard, Harvard University, Incompetence, Issues, Medical, NIAID, NIH, Pfizer, Pharmaceutical. You can follow any responses to this entry through the RSS 2.0 feed. You can leave a response, or trackback from your own site. Listed below are links to blogs that reference this entry: HAART Exposed: Sustiva Causes AIDS Symptoms. The medical industry is the biggest drug pusher on planet Earth. In most cases they are selling dangerous and addictive drugs no better than crack and heroin, and with no better intentions than dollar profit. Glad we have this website to keep things in check. Please make a donation to HAART! It is truly sad how these companies take advantage of the ill. Sick. This page contains a single entry by Toni published on September 17, 2010 9:32 AM. New Study Calls For Voltaren (Diclofenac) Drug Ban - Massive Heart Attack Risk was the previous entry in this blog. BAN ASPARTAME - It Causes Rumsfeld Syndrome is the next entry in this blog.